2 tablespoon black Royal icing. 1. 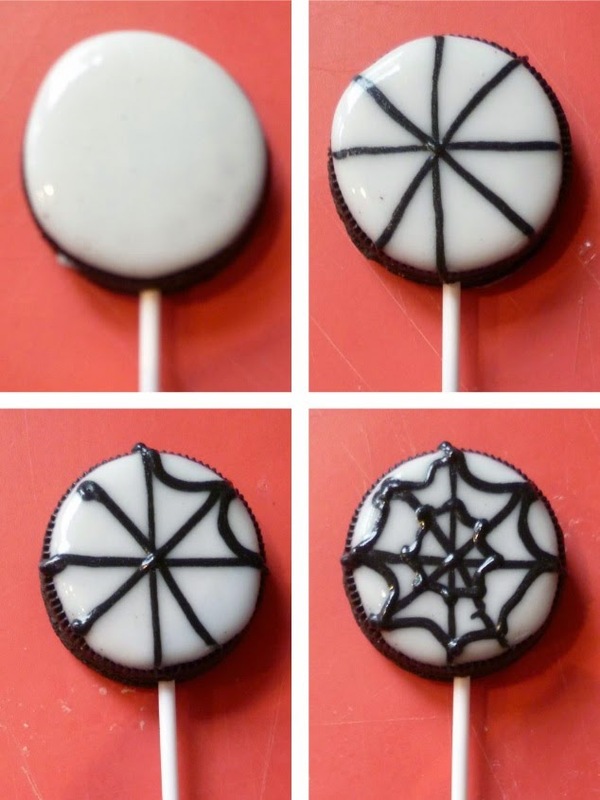 Lay the oreo out on a flat tray and gently push the cake pop stick in the centre of each very carefully.2. Fit a piping bag with a thin hole nozzle and fill it with the white icing .3. Pipe an outline around the oreo biscuit and then fill the centre of it to cover it in white icing.Leave the white icing to set for 30 minutes.4. 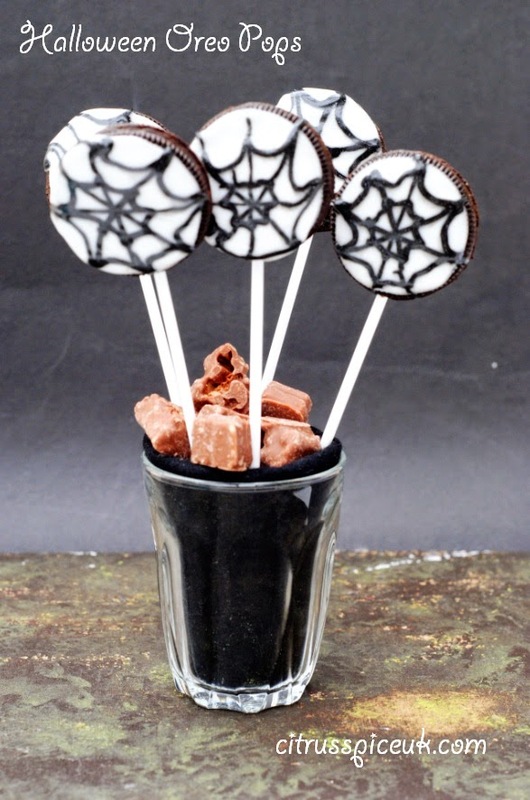 Fit a thin nozzle into another piping bag and fill with black icing. Pipe a spider web design on to the white icing and leave to set for 30 minutes.. 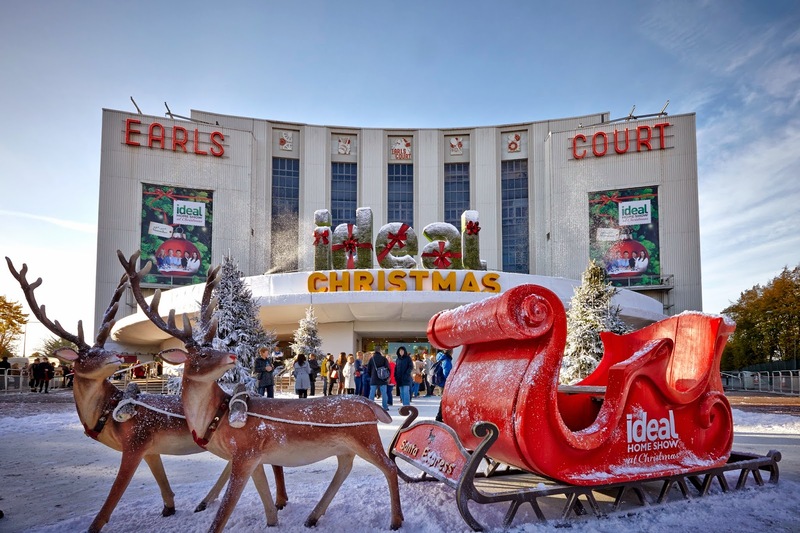 Giveaway Tickets to Ideal Home show Christmas Earls Court. The perfect place to spend a day and get all your christmas shopping done under one roof. The venue will be transformed into a winter wonderland featuring over 650 exhibitors across 7 sectors including: Interiors & Home Accessories, Food & Drink sponsored by Regina, Home Improvements & Outdoor Living sponsored by Hydropool, Fashion & Beauty sponsored by Lexus, Technology & Gadgets sponsored by Virgin Media, Christmas Gifts and Christmas Decorations. The Ideal Home Show at Christmas will feature a host of festive favourite celebrities, including celebrity chef Gino D'Acampo, English actress and celebrity chef Lisa Faulkner, interior designer Laurence Llewelyn-Bowen, gadget expert Suzi Perry, and well known TV personality and wine expert, Olly Smith. Our experts will be on hand at the show offering their own festive hints and tips to make your Christmas Ideal. · Christmas Ice Rink – The centrepiece of the exhibition is a spectacular ice rink There will also be a Bandstand, which will feature a whole host of festive music. 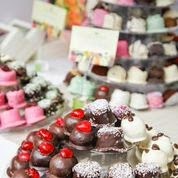 · The Christmas Theatre sponsored by Gocompare.com – The main theatre will host talks and workshops from a range of experts to advise on how to create the perfect homemade Christmas. 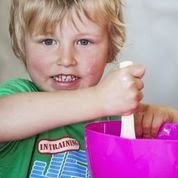 The hourly sessions will focus on making Christmas cards, festive wreaths, decorations, table settings and much more! · The Christmas Catwalk sponsored by Lexus – A round up of the latest trends and festive fashion, from the best Christmas party dresses, hair styles, and make up looks to ensure you look your best throughout the party season! · The Christmas Champagne Bar sponsored by Hydropool – Treat yourself with a glass of bubbly and relax after all that shopping! · The Christmas Food &Drink Theatre sponsored by Regina – This interactive theatre will feature top celebrity chefs, including Gino D'Acampo, and drinks experts including Olly Smith, giving you handy hints and tips for your Christmas culinary creation and festive tipples to match. With live cook along demonstrations, foodies are able to learn from the experts in how to cook up a storm in the kitchen this Christmas. · The Gregg Wallace Christmas Restaurant - The acclaimed restaurant returns for another year, hosted by friend of the show Gregg Wallace, providing a traditional Christmas lunch with a twist. · Ideal Christmas Book Shop – A chance to browse through all the latest offerings from Celebrity Chefs and Bakers, plus DIY and Gardening experts, and find the best Christmas presents, all at exclusive show prices! 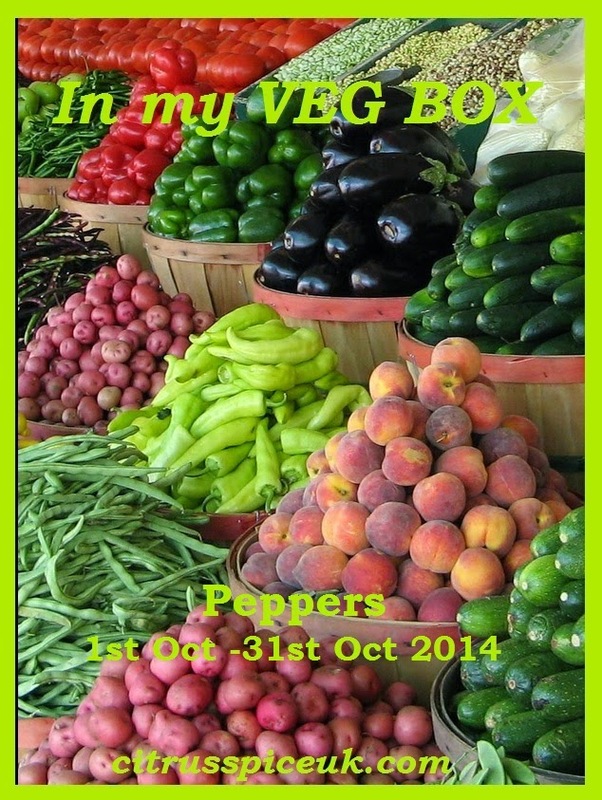 Plus personalise any gifts by having the book signed by your favourite chef or expert while at the show. · Christmas Smart Home Technology powered by Virgin Media – To get you up to date with the latest gadgets and technology must-haves, we will be providing the lowdown on the hottest gadgets and technology to create your ideal Christmas. The friendly guys and girls from Virgin Media will also be on hand to tell you all about their latest offers and services. 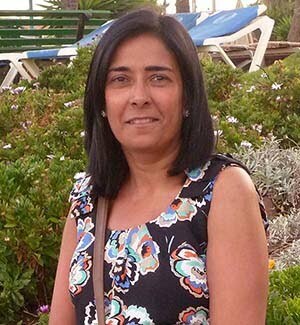 Ideal Home show Christmas has been very generous and have offered citrusspice a chance to giveaway 5 pairs of tickets to citrusspiceuk readers. 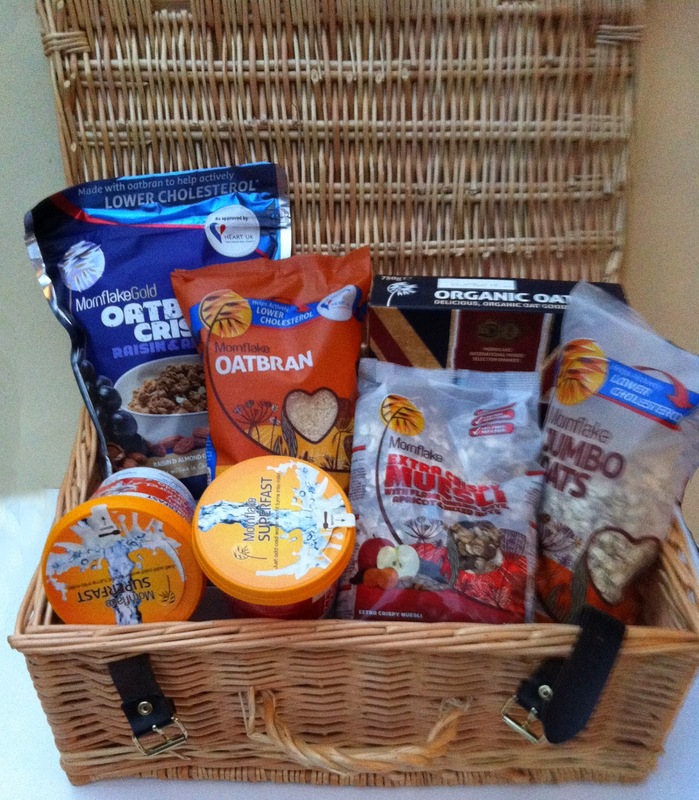 I recently received a hamper from Mornflake and I am loving all the products that arrived in my hamper. 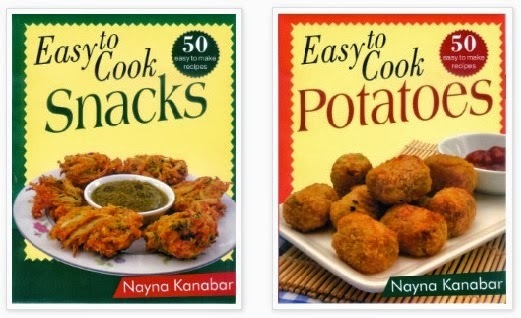 I have created a few recipes with the products, you can see the recipe here. I am really excited that mornflake have been generous and agreed to send one citrusspice reader a Mornflake hamper to enjoy too. There are many types of oats such as Oats, Groats, Pinhead Oatmeal, Oat Bran, Jumbo Oats, Superfast Oats, Oatmeal and Organic Oats.They have a high fiber content, and they help remove cholesterol from the digestive system. High cholesterol levels correlate with the build up of plaques in blood vessel walls. If these plaques become damaged or grow too large, they can rupture, blocking a blood vessel and causing a heart attack, stroke, or blood clots elsewhere in the body. Lowering high cholesterol levels can therefore significantly reduce the risk of cardiovascular disease and stroke. Mornflake is a company that sell a range of Oat based products, the range consists of different types of oats, Oatbran cereals, Muesli, porridge pots, cereal pots , oat bran and oat granola. I was sent a lovely hamper with some Mornflake products to try. We have enjoyed the breakfast pots and I have also been baking with the oats. 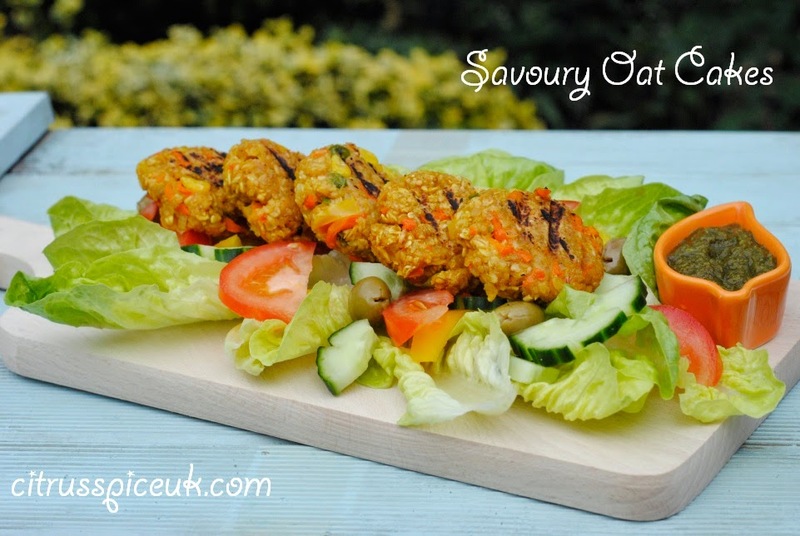 I found that Oats are very versatile and they are also great for adding to savoury dishes too. 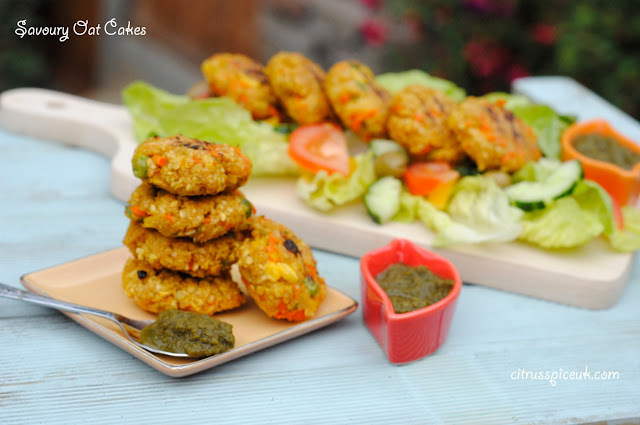 I created these spicy oatcakes for lunch and they were simply delicious. 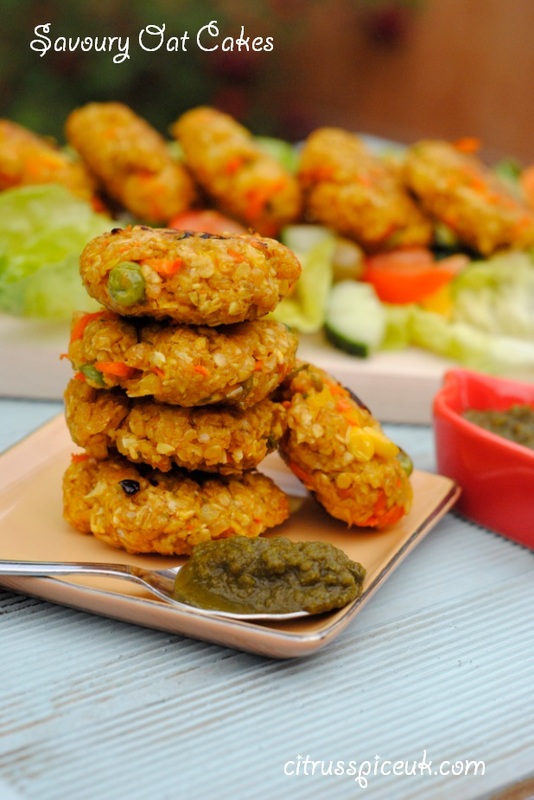 Savoury Oat cakes with a medley of vegetables. 1. Peel the potato and carrot and grate them.2.Peel the onion and finely dice it.3. Add the potatoes, carrots, peas and sweetcorn to a glass bowl and add 2 tablespoons of water.Cover and microwave on high for 4 minutes until potato and carrots are cooked.4. Add 1 tablespoon oil to a frying pan and saute the onion on medium heat until it's translucent.5. Add the cooked vegetables to the onions, followed by the salt, green chilli paste, ginger paste, red chilli powder and lemon juice.6. Add the oats to the mixture and combine it on a low heat for 2 minutes until the vegetables, oats and spices are well mixes.You should not need to add any extra moisture as the vegetable mixture should be adequate to bind the oats.7. Once the mixture comes together, take it off the heat and allow to cool slightly.8. With wet hands, pinch lime sized balls from the mixture and roll into balls, Flatten to form round discs. Place on baking tray.9. Place the cakes into the fridge to chill for 30 minutes.10. Heat a griddle pan and brush it with oil. Place the oat cakes on the pan and brush them with a little oil. Cook the underside for 2-3 minutes after which flip them over to cook the top side for another 2-3 minutes. You should have nice griddle lines on them.11. Cook the remaining oat cakes on griddle.Serve the savoury oat cakes on a bed of green salad with a chilli dip. I haven't posted my regular smoothie recipe for a while, that does not mean I have stopped making them and drinking them. On the contrary my family have gone smoothie made and each member is trying to out do the other by concocting unique smoothies. This is really pleasing me as they are trying new ingredients that I could have never got them to try. 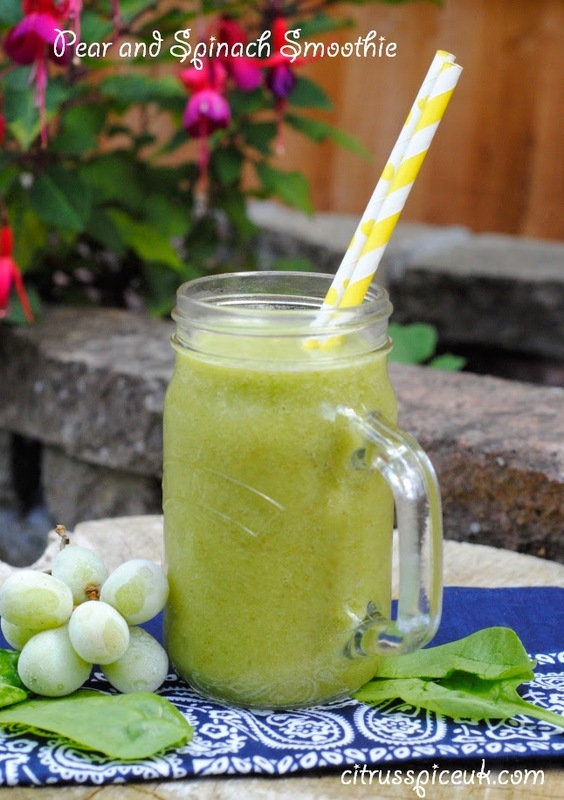 This pear and spinach green smoothie was created by my daughter and it really did turn out super delicious.Thanks to Optimum 9400, my angel in disguise who has converted my green veggie shy kids into smoothie junkies!!! Healthy and Delicious Vitamin packed smoothie. 1. Place the grapes in the freezer overnight.2. Half the pears and remove the core and seeds, add them to the Optimum 9400 blender jug.3. Add the spinach, frozen grapes, ice cubes, pear Juice and honey and blend together on low speed, gradually increasing the speed for 1-2 minutes.4. Pour the green smoothie into serving glasses and serve chilled. I made my smoothie in the Optimum 9400 blender, it is a great blender that will create amazing smoothies, ice creams, sorbets, smooths, nut milks in a jiffy. It also grates, slices and grinds. 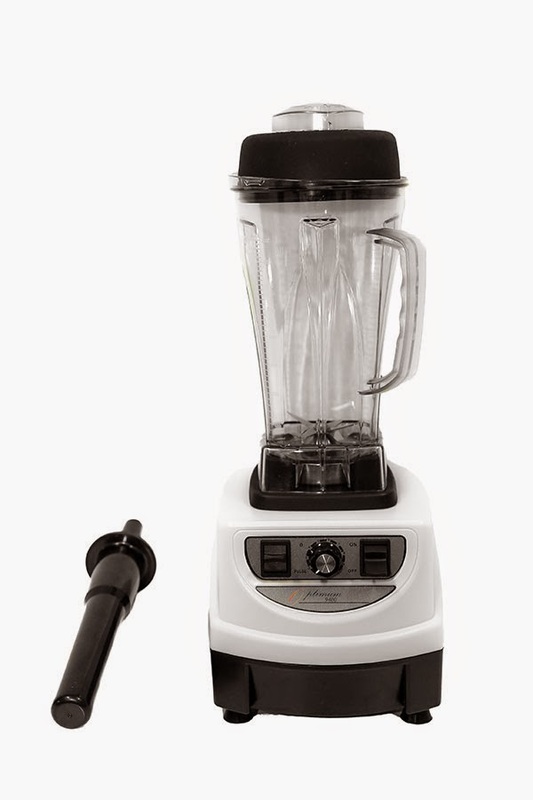 If you decide that you want to purchase the Optimum 9400 blender then please do order it from this link as you will get an extra two year warranty on it. Make sure you put in the comment box "special ambassador offer"
‘Foodies Festival Christmas’ to be held at the Old Truman Brewery in Spitalfields London, 28th – 30th November 2014. Gingerbread House serving ginger beer and roasted ginger marshmallows. Hands-on masterclasses in cake decorating, where you can personalise eatable treats to hang on the Christmas tree at home. 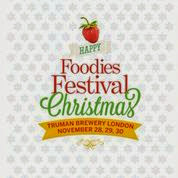 A wonderful day out enjoying the Christmas atmosphere and ideal for sampling wonderful Christmas food, wines and beers. For event details and tickets click here. How to create a recipe box / card for your blogger blog. Its been a little while since I posted a technical tutorial on this blog so today I am going to share how you can add a recipe box / card to your blog post. 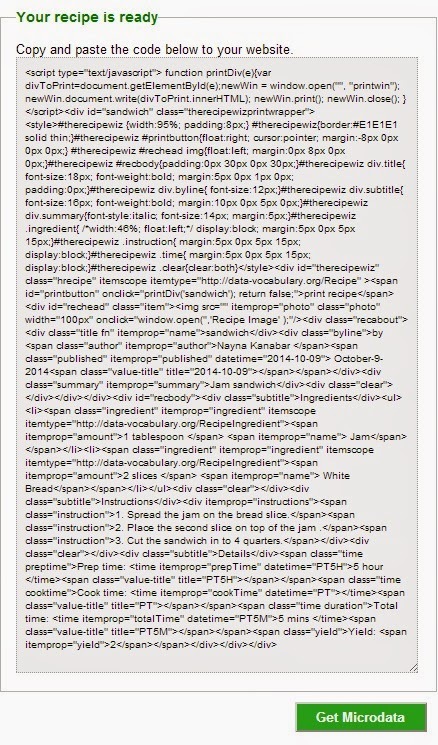 The reason one should add a recipe box is that it writes the recipe in microdata form which in turn makes the recipe easier to find across the internet. 1. Go to any site such as photo bucket or image shack and create an account where you can upload a photo and get a direct link to your recipe photo you want to use on your recipe card. Upload your photo and copy the direct url and keep a note of it by pasting it in note pad. You will need this in step 2 at the very end. 3. 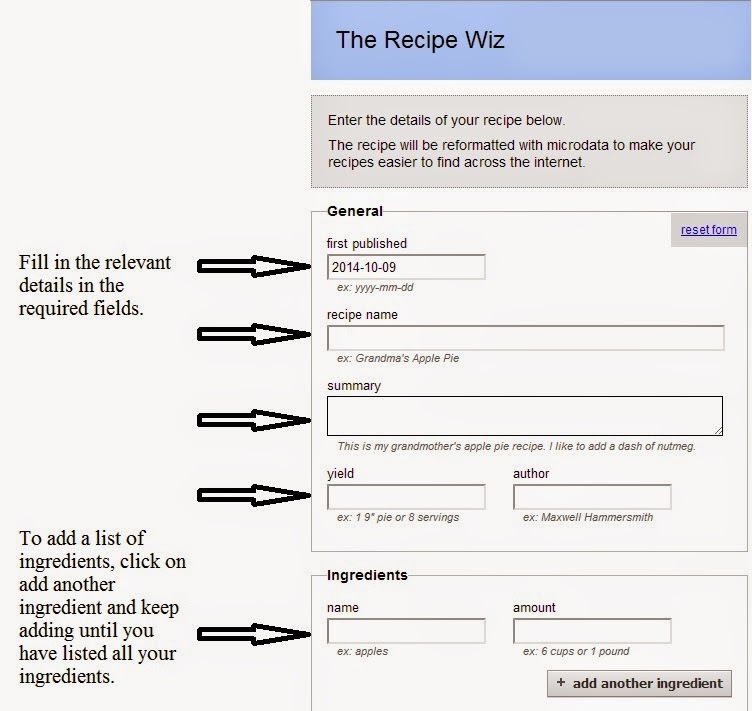 Fill the recipe box tabs with the recipe instructions. 5. 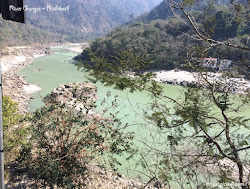 Create a new post in blogger. 6. 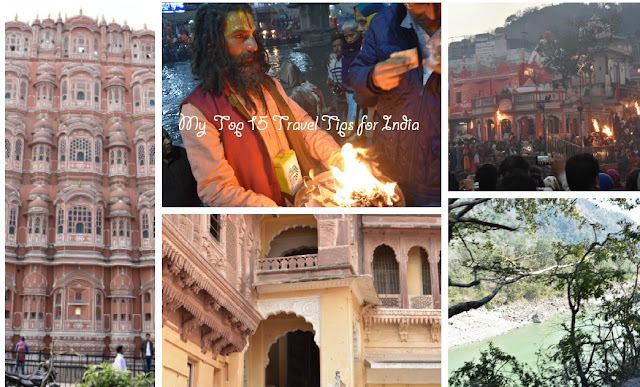 In blogger you need to have your post open in html format. 7. 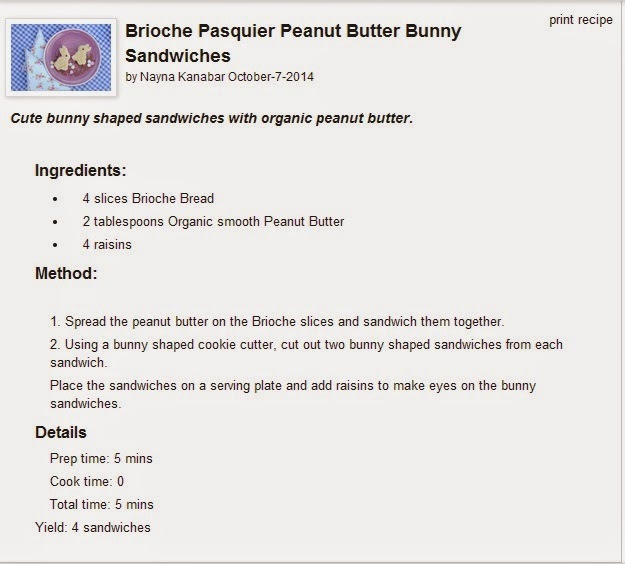 Once saved, your recipe card will have a photo of your recipe and all the instructions of your recipe written in microdata format finding it easier to find your recipe on the internet. 8. You can add additional text and photos above or below your microdata code if you wish to add more information or images in your post. 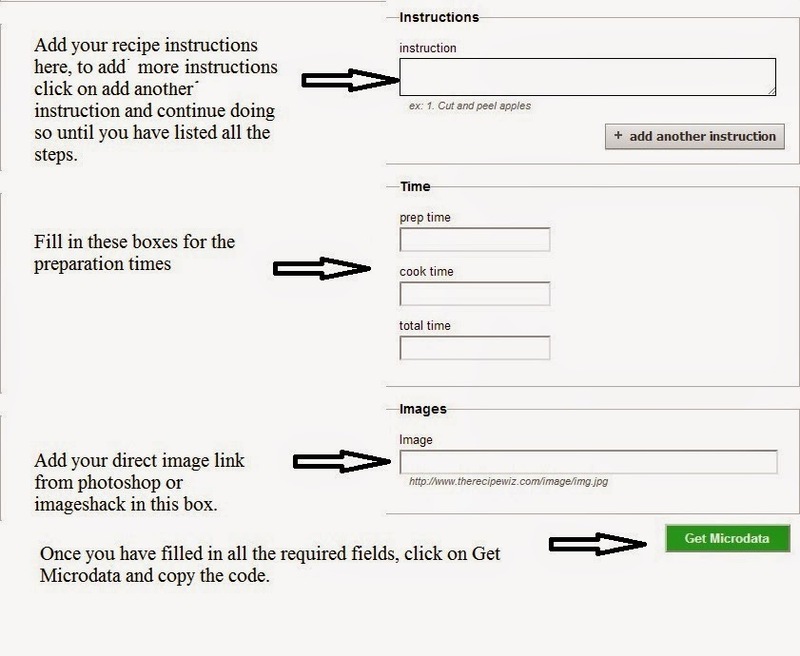 However the microdata template will allow you to show one thumbnail picture only on your recipe card.